Each chapter offers some of the most profound, transformative tools and resources available. Part 2: Five Golden Rules to develop exceptional writing skills. By implementing the step-by-step practices detailed in each chapter, students experience greater confidence and are able to move forward in school and pass exams. 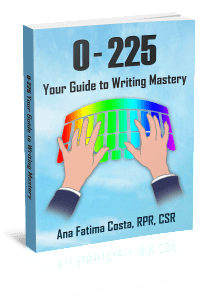 Are you ready to dive into the 5 Golden Rules to Steno Mastery Course in depth to develop shorthand mastery and self-confidence? © Ana Fatima Costa. All Rights Reserved.